The landscape of high-end point and shoots has changed significantly over the past couple of years. Canon's two-year-old G1 X used to be unique and sought after, but Sony's RX100 and RX100 Mark II redefined what a point and shoot was capable of. Now it's Canon's turn to play catch up. The revamped G1 X Mark II, available in April for $800, is replete with updated components, starting with a new 1.5 inch 12.8 megapixel CMOS sensor. Yes, that's actually less resolution than the original 14 megapixel G1 X, but having larger pixels that collect more light may improve the camera's low light performance. The engine is a DIGIC 6 chip, an upgrade from the DIGIC 5, which Canon says will improve the autofocus speed. At this point, speed improvements will have to be great, because the original G1 X was considered sluggish even before the RX100 raised the bar. Optically, you will find a newly designed 24-120mm equivalent f/2-3.9 zoom lens. This is a vast improvement over the old 28-112mm equivalent f/2.8-5.8. Any compact camera wanting to be taken seriously by enthusiasts or pros must have a large aperture. The G1 X Mark II should compete nicely against the Sony RX100's 28-100 f/1.8-4.9 lens. With the Canon you will get a wider field of view, longer zoom, and brighter telephoto performance. Much has changed on the outside as well. The optical viewfinder has been scrapped and replaced with, well, no viewfinder at all (Canon makes a hot-shoe mountable EVF sold separately). That might not play so well with traditionalists, especially with so many terrific electronic viewfinders gracing mirrorless systems these days. Instead you're left with a capacitive touch 3-inch LCD. It doesn't flip out sideways like the old camera, but does flip up 180 degrees for the selfie-inclined. The G1 X Mark II's manual controls appear to be a mixed bag. On the one hand, it lacks both the front setting wheel and the top exposure compensation wheel of the old version. That means you will have to control the camera's exposure with the touch-screen, which actually shouldn't be as frustrating as it sounds, as Canon has historically excelled at implementing touch settings. Where you gain control is around the lens, which features two rings, one for controlling focus, and one for zoom. You can also program one of the lens rings to control aperture or shutter speed. As with most new cameras nowadays, the G1 X is equipped with Wi-Fi and NFC for sharing to your heart's content. 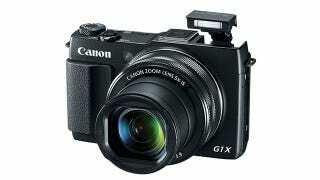 The big question for Canon is whether the G1 X Mark II can compete with the likes of Sony for point and shoot supremacy. It will be a tall order, considering the universal praise heaped upon the cheaper RX100 and its Mark II brother. While the new G1 X has a better spec'd lens, it still looks much larger than the pocketable RX100, and remains a question mark in the vital areas of image quality and outright speed. We'll know for sure just as soon as we get to try it out for ourselves.